The weather is hot here and cold soba is just perfect for that! I made a smiley face with veggies above the soba noodles and I am guessing that he is not going to eat the cucumber peel mouth. I was going to cut nori for the mouth but was in a hurry, thus the cucumber peel since I was cutting cucumber for the eyes. Main compartment - Organic soba noodles, broccoli hair, cucumber eyes, nori pupils, baby carrot cheeks, edamame nose and cucumber peel mouth. Lower left - Pretzels and tsuyu sauce for the soba in a leak proof Monbento sauce cup. Upper left - Orange slices. Upper right - Ham roll ups. I love soba too! 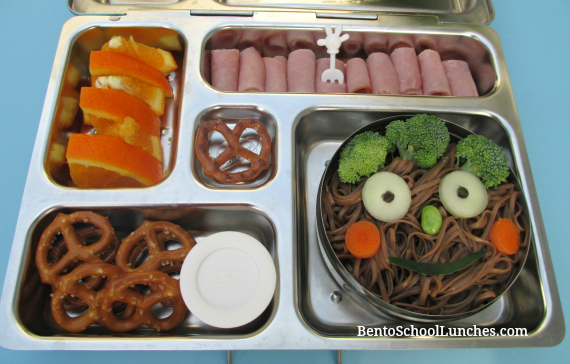 This is such a cute and yummy bento!